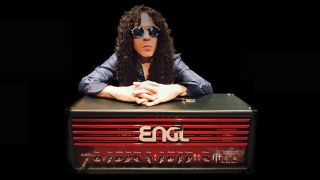 NAMM 2017: Former Megadeth guitarist and shred legend Marty Friedman has collaborated with Engl on a signature amp head, the Inferno. Two years in the making, the Inferno boasts a 100-watt output, with four EL34 power amp valves and four ECC83 preamp tubes. The amp's two channels each pack a gain boost switch, plus a bright switch for the clean channel, while a noise gate is also onboard. A series or parallel effects loop is included, too. "The sound I got on the Inferno album was done with a combination of the Engl Special Edition, Powerball, Steve Morse Signature and the Invader amps," Marty explains. "The Engl engineers analysed what I was and wasn't using from each of these amps to get those monster tones, and they created a 'Frankenstein' out of those amps customised to the types of tones I like to use." Nicely. The Inferno is available from Spring 2017 for £1,557/$1,999.